This completely remodeled 5-bedroom home in desirable Country Ridge Estates boasts Pikes Peak views on 0.70 acres with gorgeous mature aspen grove! The tri-level design means minimal stairs but separation between living areas. The main level has a large entry hall that connects the custom kitchen and great room dining/living area. 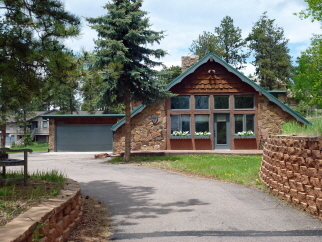 The living area has a two story word-burning fireplace, vaulted ceilings and Pikes Peak Views. The upper level has 3 bedrooms, 2 baths & laundry chute. The large lower level family room has a cozy gas fireplace and wet bar. Two more bedrooms and a bath downstairs work great for extended family, a home office or hobby room. Interior Features NEW: Granite counters, stainless appliances (dishwasher, refrigerator, trash compactor, double oven, microwave), carpet and hot water boiler in 2014! Exterior Features Low maintenance stucco, metal roof, stamped concrete patio. Large storage shed. RV parking. Additional Features and Amenities SHORT SALE. ACCEPTING BACK UP OFFERS!! Walking distance to Woodland Park Schools!